YouTube channel B Channel has uploaded a video providing an in-depth tour of the 2018 Honda Brio. The new generation model was officially released at the GIIAS 2018 yesterday. The new Honda Brio is underpinned by the second generation Honda Amaze’s platform. The redesigned model is 175 mm longer than the model it replaces, and 60 mm of this extension is by the elongated wheelbase which measures 2,345 mm. The all-new Honda Brio is differentiated from its predecessor with the Honda Mobilio's headlamps that give it a fiercer look, the upswept belt line on the sides and the conventional tailgate and the Ford Figo-like tail lamps at the rear. Another small detail that is new is the rear micro roof antenna. As before, a sporty RS variant is available. Powering the 2018 Honda Brio is a 1.2-litre i-VTEC petrol engine. This is the same unit that Honda employed in the old model. It develops 90 PS at 6,000 rpm and 110 Nm of torque at 4,800 rpm. As before, a 5-speed manual transmission or a continuously variable transmission sends the drive to the front axle. Tilt steering, 6.1-inch Display Audio touchscreen infotainment system, automatic climate control, standard dual airbags, standard ELR seatbelts (front and rear), standard seatbelt reminder, standard speed-sensing auto door lock and standard rear parking camera are the equipment highlights of the 2018 Honda Brio. 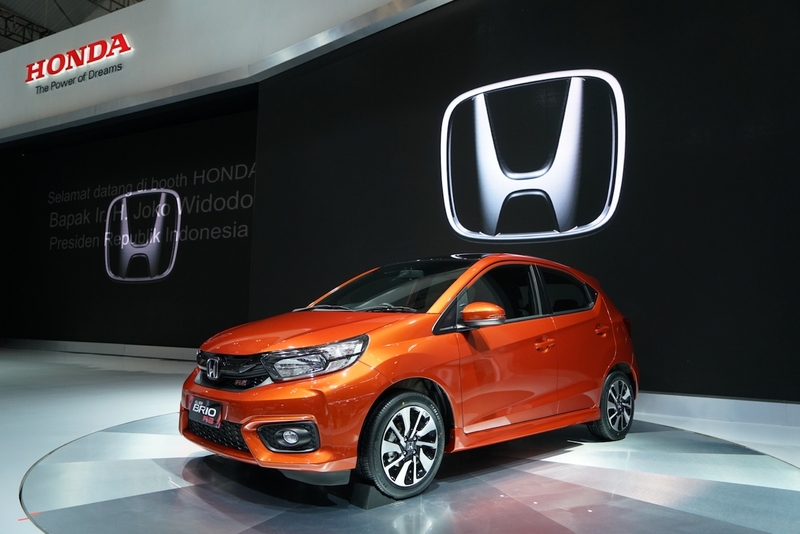 The Honda Brio is Honda's best-selling model in Indonesia, with 2,37,272 units sold as of July 2018. The 2018 Honda Brio comes to Indonesia in S M/T, E M/T, E CVT, RS M/T and RS CVT and prices range from IDR 132,500,000-180,000,000 (INR 6,29,068.65-8,54,583.82). The all-new Honda Brio won't arrive in India before FY2020 (April 2019-March 2020) and consider that Honda hasn't disclosed renewal plans yet.